By Sister Marie Thérèse, M.I.C.M. All for Brother Francis from a devoted spiritual daughter. This was a beautiful talk on the crusade as it was bequeathed to Saint Benedict Center’s religious and third order through the wisdom of Brother Francis. The “something more,” as Sister put it, that Brother Francis passed down as his patrimony to his disciples was the Saint Augustine Institute of Studies and its Syllabus. Stressing that wisdom in its highest sense is even more than a gift of the Holy Ghost but Truth itself in the Person of the Word of God. In receiving Holy Communion this morning, Sister said, we received Wisdom as an Eternal Person. What a beautiful thought! A touch of the Thought of God, the Logos. Brother Francis, she said, had so many virtues, but his humility struck her the most. How could a man so wise be so humble. “I am a student in every class I teach,” he used to say. Sister then took the audience through a survey of the Syllabus, beginning with the nine books that were required reading for all third order members. She talked about simple things, the child-like things, that make the Syllabus so do-able. Twenty-four book reports; that’s all — and only two paragraphs about each book with one’s favorite quotations. Sister pointed out that Brother Francis, in keeping with the spirit of the Center, advised all his students to make a daily routine of prayer, work, and study. In this, especially third order members, one can live a spiritual life in any state. Finally, she emphasized the importance of getting the Institute’s diploma, and really earning it. 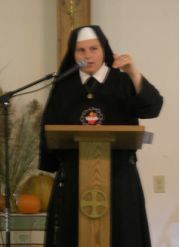 At the end of her talk Sister played a short recording from Brother Francis talk on the Institute. He said that if the Church in the United States had just 200 zealous apostles who knew their Faith, the country could be converted. We must work at becoming the “leaven” which Brother Francis believed would expand the true Faith in America and win countless souls for Christ in His Church of salvation.